The Canadian government is seeking to block the release of an ex-Guantanamo Bay inmate as he appeals against his war crimes conviction in a US court. Omar Khadr, once the US prison's youngest inmate at age 15, was granted bail by a Canadian judge in April. The Canadian government sought the emergency stay on Monday. Khadr could be released as soon as Tuesday. Khadr, now 28, spent 10 years in the Guantanamo prison after being captured in Afghanistan in 2002. 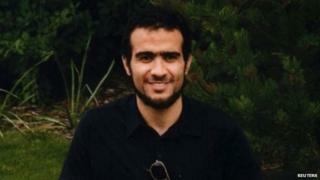 The Toronto-born Khadr was released from Guantanamo Bay after a plea deal and sent back to Canada in 2012. He is currently serving an eight-year sentence in Canada for war crimes including throwing a grenade that killed a US Army sergeant in Afghanistan. Khadr, whose family had ties to Osama Bin Laden, has said he only pleaded guilty so he would be released from the Guantanamo Bay prison. Canadian Prime Minister Stephen Harper has been critical of the judge's decision, saying the release would jeopardise relations with the US. "We feel that Mr Khadr, until a final decision is rendered by the court, should stay behind bars," Canadian Public Safety Minister Steven Blaney told CBC News.